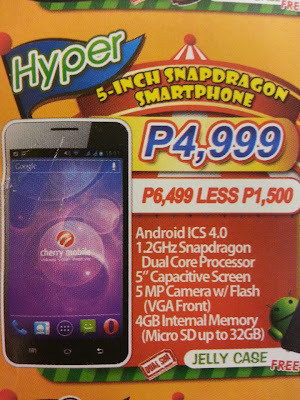 Last month, Cherry Mobile launched the Cherry Mobile Omega HD (first HD smartphone) and the Cherry Mobile Flame 2.0 (first quad-core smartphone) but today another Android ICS smartphone with a 5-inch display and 1.2GHz Snapdragon called Cherry Mobile Hyper was first leaked and confirmed on Facebook by Cherry Angel, a known Cherry Mobile retailer at 168 Shopping Mall in Binondo, Manila. More details after the jump. According to the leaked flyer Cherry Mobile Hyper has a 1.2GHz dual-core Qualcomm Snapdragon processor, Android 4.0 ICS, 5-inch capacitive display, 5MP camera with LED flash, VGA front camera and 4GB of internal storage. For only Php4,999 (SRP), the Cherry Mobile Hyper also reminds us of the original Cherry Mobile Titan except for the different back-cover, navigation keys and front-facing camera placement. It also has the same specs except for the dual-core Snapdragon processor and its marked down price tag from Php6,499 (Cherry Mobile Titan) to just Php4,999 (SAVE Php1,500). Please do take this post with a pinch of salt until Cherry Mobile officially unveiled the Cherry Mobile Hyper on April 6, 2013 (Cherry Mobile Fiesta Sale). So, stay tuned! they should have increased the price to P6K and make it JB and a 1GB Ram, the usage and specs value will suffer if not.